The Wabash Railroad took delivery of 25 "Mountains" from the Baldwin Locomotive Works in 1930. 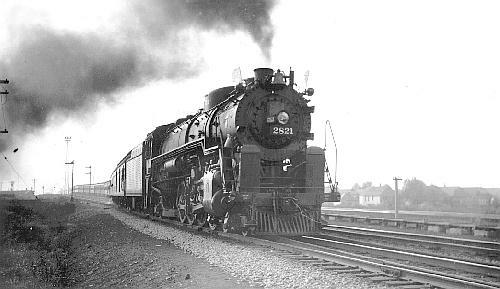 These Class M-1 locomotives carried road numbers 2800 through 2824 and had 27 x 32 cylinders, 70" drivers, a 240 psi boiler pressure with a resultant tractive effort of 67,400 lbs and weighed 406,400 pounds. The Wabash intended to use these "Mountains" for dual service, but because a similar number of "Northerns" arrived at the same time they were used mostly in freight service. There are no surviving Wabash "Mountains". Nineteen were scrapped in 1953 and the remaining six went to the scrapper in 1955. Data from WAB 1 - 1946 Locomotive Diagrams book supplied in May 2005 by Allen Stanley from his extensive Rail Data Exchange. See also DeGolyer, Volume 81, pp. 232. (Thanks to Chris Hohl for his 28 March 2015 email noting discrepancies in tender weights and capacities.) 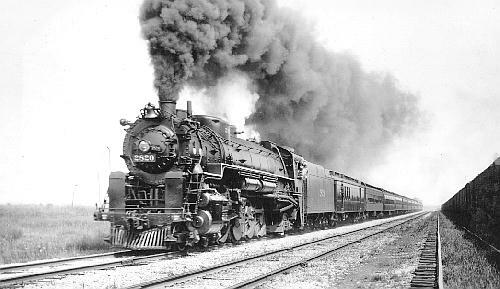 Works numbers were 61149-61158 in November 1929; 61177-61183, 61200-61207 in December. Firebox heating surface included 26 sq ft (2.4 sq m) in three arch tubes, 81.5 sq ft (7.6 sq m) of thermic syphons, and 87 sq ft (8.1 sq m) in the combustion chamber. The Worthington Type 5-S feedwater heater was located on the left side. 12" (305 mm) piston valves supplied steam to the cylinders; maximum valve travel reached 8" (203 mm). Five of the small tubes were removed in the late 1930s-early 1940s, reducing the heating surface area by 59 sq ft (5.5 sq m) to 4, 561 sq ft (423.75 sq m). The road also inched up the boiler pressure, changing the setting to 245 psi (16.9 bar) and thus raising the nominal tractive effort to 69,400 lb (31,749 kg/308.7 kN). By that time, tender coal capacity had grown to 23 tons (while water capacity remained unchanged). The larger tender weight 131,000 lb (59,421 kg) empty and 302,000 lb (136,985 kg) loaded. Intended for freights between Montpelier, Ohio and Decatur, Illinois). Drury (1993) notes the strong similarities between these Mountains and the Northerns (Locobase 285) delivered by the same builder to the same railroad at the same time for the same service (freights between Montpelier, Ohio and Decatur, Illinois) and adds: "The question 'Why not 50 of one type?' remains unanswered." An article in Railway Age 14 February 1931 doesn't answer the question, certainly, saying only that the chief difference between the two was the larger grate in a longer, wider firebox. See Locobase 285 for a discussion of other changes meant to maintain the balance of direct heating surface area and evaporative heating surface area.